Providing adapted e-health services, applications and platforms responds to a growing need of medical institutions like hospitals or even homes. Patients with long-term conditions, elderly and dependent persons need to receive e-health services and assistance in a simple, continuous and non intrusive way. When the e-health ecosystem meets the needs of targeted people and gains their acceptance, provided services will help to tackle the problems that face the nowadays worlds population such as dependency, aging and healthcare for all. According to the United Nations projections, in 2050, the old-age dependency ratio of the population aged over 65 years will approximate 51,70% of the rest of the population. This situation points out the issue of developing autonomic healthcare systems and platforms that helps people to manage their own health with new services and better adapt institutionally based services. The international IEEE workshop of e-Health Pervasive Wireless Applications and Services e-HPWAS'16 (in conjunction with the 12h IEEE WiMob conference) targets providing optimal, secured and context aware e-health services with the best quality of services (QoS) and users experience (QoE). Applications and services are considered in wireless environments and architecture with the use of IoT (Internet of things), big data analysis and a strong heterogeneity of the used access technologies, sensors, terminals, users needs and services (data, content, live streams or complex network services). Emerging e-Health services and applications can involve the use of heavy content such as multimedia content and streams (e.g. 3D-TV, media conferencing, remote live diagnostics) using conventional e-health equipments and devices but also using modern devices like smart TV sets, home-boxes, smartphones and tablets. The considered issues of e-HPWAS are related to e-Health care and safety services provided for patients, elderly and dependent persons. These services are generally built using different communication technologies, for different profiles of people and in different contexts and places (e.g. in health institutions, at home, in the city). Ideally, provided services should be accessible anytime, anywhere and using any kind of device or platform. Different norms can be used within the e-health ecosystem hence the network interoperability has to be considered carefully in the design of context aware applications and services. Heterogeneity is present at different levels and still an open issue in e-health systems. In addition to the heterogeneity of patients' profiles and service characteristics, the health environment involves a wide range of required sensors and actuators (e.g. blood pressure and temperature, insulin delivery, appliance control, presence sensors) that can be sometimes very close to the user such in Body Area Networks. Sensors use usually different wireless access methods, need to work together and communicate with the rest of the infrastructure (if it exists): gateways, servers, local smart objects or with the intelligence existed in the medical institution, home or in the cloud. Faced to the strong heterogeneity of the environment where e-health services are provided, mechanisms of making autonomic decisions (e.g. diagnostics, continuous monitoring, alerts, assistance) have to be identified and studied in different levels. For a given service or application, the automatic identification of required sensors and actuators should be ensured and tailored to the context of the person (e.g. health status, mobility, dependency degree) and the characteristics/constraints of the used communication technology and the platform. Other opened issues concern the deployment and placement of sensors in the communication architecture. Services deployment should be optimized to guarantee the best network coverage, coordination between sensors and middleware or gateways, possible attachment to the network infrastructure and delay tolerant networking aspects. The cohabitation of different access methods and communication technologies of sensors and the other devices involves sensor/device discovery, network attachment and exploitation of the function that a sensor could provide. The heterogeneity of the communication technologies used within the same e-health system may affect negatively the performance of the architecture and result on a non optimized network traffic even only in the discovery phase of existing sensors and services. Dealing with the existing heterogeneity should lead to optimal approaches that identify available sensors and devices, available functions provided by the hardware, available services and their possible composition to match a given context, normalized interfaces required to interact with the different actors in the e-health context aware ecosystem. 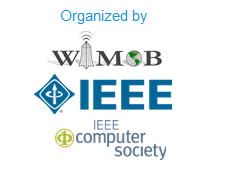 All accepted papers will be published in the 12h IEEE WiMob conference proceedings published by IEEE, and will be accessible via IEEE Xplore Digital Library and indexed by DBLP. The workshops will be held on October 17, 2016. All papers will be considered for the Best Paper Award. The workshop organizers will select a number of candidates for the award among accepted papers. The e-HPWAS organizers plan to have selected papers appear in a special journal issue. A selection of accepted papers of high quality will be considered and authors will be invited to produce an extended version to be published in a special issue of a specialized journal.